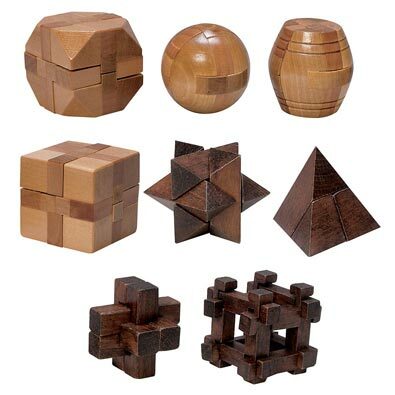 Each of these wooden brainteaser sets contain four classic designs from the first brainteasers known. Can you take them apart and put them back together again without losing your patience? Solutions included. Each puzzle measures approximately 2" x 2". Each of these wooden brainteaser sets contains four classic designs from the first brainteasers known. Can you take them apart and put them back together again without losing your patience? Solutions included. Each puzzle measures approximately 2" x 2".